Volvo V60 Interior, Sat Nav, Dashboard | What Car? As is typical with Volvo, you get a supremely comfortable driver’s seat with power adjustment if you step up to Inscription or any Pro trim. Most importantly, whichever version you choose, you'll find bundles of adjustment available in the seat and steering wheel, and, because the pedals line up perfectly with both, you feel wonderfully relaxed behind the wheel. 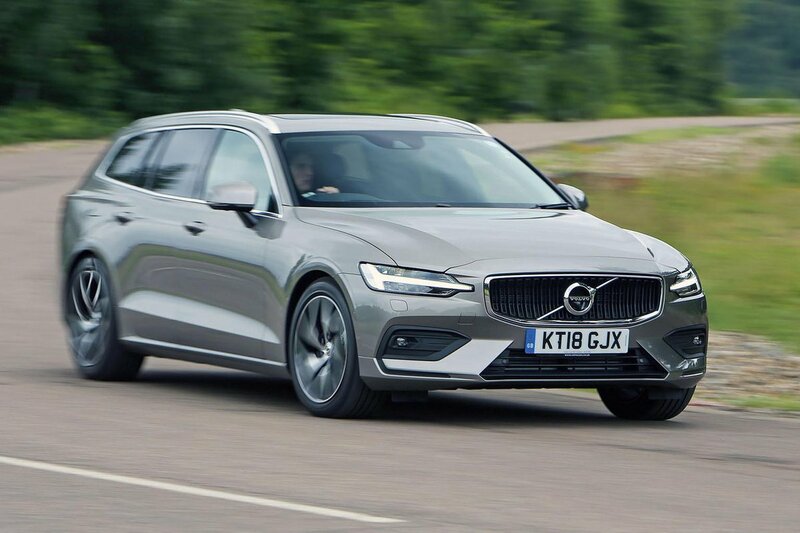 That’s not always the case with its rivals; the Audi A4 Avant, Mercedes C-Class Estate and BMW 3 Series Touring hinder drivers with slightly offset pedals and/or bulges in their transmission tunnels. Seeing out is fairly easy, thanks to relatively thin front and rear pillars, plus you get rear parking sensors standard on all models (front parking sensors, a rear-view camera and a 360deg camera system are optional). It’s easy to see at night, too, because high-intensity LED headlights are fitted to all models, with adaptive LED headlights standard on higher trims. Every V60 has a 12.3in screen that replaces traditional analogue dials with digital instruments that you’d have to pay extra for on an A4. Volvo's digital instruments aren’t quite as configurable as Audi’s Virtual Cockpit, but they still deliver plenty of useful information – including media, telephone and navigation data – right in front of the driver. A head-up display is standard on Momentum Pro and Inscription Pro trims, to help keep you focused on the road ahead. 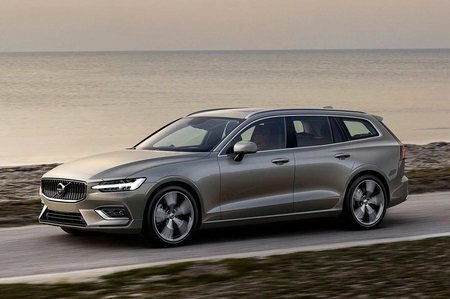 Volvo is making quite a name for itself when it comes to great interiors and the V60 is no exception. Material quality is very near to the benchmark A4’s in terms of sturdiness and is better than that of the C-Class and 3 Series. And despite its minimalist Scandi design, the interior is sumptuous, as well as light and airy next to its often glummer German equals. Mind you, minimalism has its drawbacks. 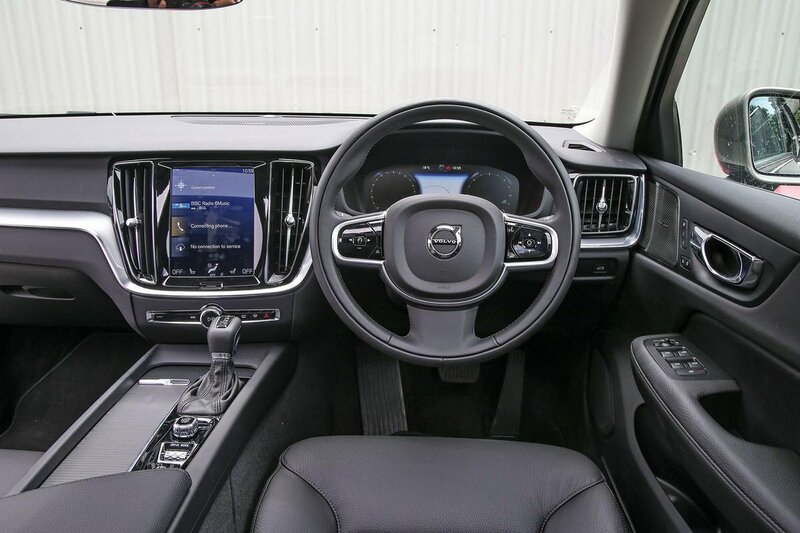 As with other Volvos, the dashboard is dominated by a 9.0in tablet-style touchscreen that has allowed the designers to slash the number of buttons to create an uncluttered feel. While it looks great, you tend to miss the intuitiveness and less distracting nature of physical buttons. You see, swiping, pinching and scrolling – just like you do with an iPad – is fine when you’re stationary; on the move, it means simple tasks, such as changing the radio station or tapping an address into the sat-nav, require you to glance away from the road. That’s why we prefer the less distracting rotary dial-controlled infotainment systems that Audi and BMW use. Still, the screen is ultra-sharp and there is a voice-activated system to operate some functions. You also get plenty of features, including standard sat-nav and a DAB radio. There’s also Volvo On Call, an app that lets you operate certain functions from your smartphone – for example, to remotely preheat or cool the interior, or send an address to the sat-nav. Apple CarPlay and Android Auto smartphone mirroring are available as an option. The default stereo is a 10-speaker system, which audio buffs can upgrade to a punchier 600W, 14-speaker Harman Kardon unit. Those who are really serious about their music have the further option of a Bowers & Wilkins system with 15 speakers and 1100W – but be warned, it’s not cheap.